Whenever I go to a concert or other packed event, I get anxious. It’s not even that I worry about anything in particular, I’ve just had social anxiety for most of my life. The thought of being crammed tight against other people sends my mind spinning and holds me back from a lot of events that I’d otherwise really enjoy with my friends. So when my roommates told me they were buying tickets to see my favorite band, I had to find a way to go. I decided to pick up a vape cartridge for the show since the indoor venue doesn’t allow smoking. I only have a standard 510-threaded vape battery and wanted something that would put me in the right state of mind for the show: a balanced hybrid that doesn’t hit too hard or cause even more anxiety. After consulting a cannabis concierge and local budtender, I chose the “relaxing but uplifting” Pineapple Afghani .5g cartridge by AbsoluteXtracts (ABX). This strain-specific CO2 vape oil is part of a special line produced in conjunction with Emerald Cup Concentrates, a NorCal-based brand like ABX known for their selected sun-grown strains. Will the hybrid vape oil remedy my concert concerns and put me in party mode, or make me feel like I’m being trapped and trampled in a mosh pit? Almost showtime. I opened the thin, rectangular box on the way to the venue. The bright, colorful packaging is clearly labeled and doesn’t waste space. A detailed drawing of the cartridge with a cannabis leaf in the background wraps around the box. Although a side sticker shows the major cannabinoid content (74.2% THC and 0% CBD), batch number, “use by” date, testing lab, standard government and safety statements, it didn’t list the remaining cannabinoids in each batch or any of the predominant terpenes. I’d also like to see a brief explanation of their extraction process as opposed to “cannabis oil” as the only ingredient on the “ingredients” list. Beneath the durable, pocket-size box the cart comes housed in a clear plastic tube with a push-and-twist-open cap. There are also foam rings on the mouthpiece and base to stabilize and prevent damage from jiggling inside. This extra layer of protection is refreshing, reassuring and, sadly, not always a given. It’s also small enough to easily slip in my pocket and stay safe without the box. 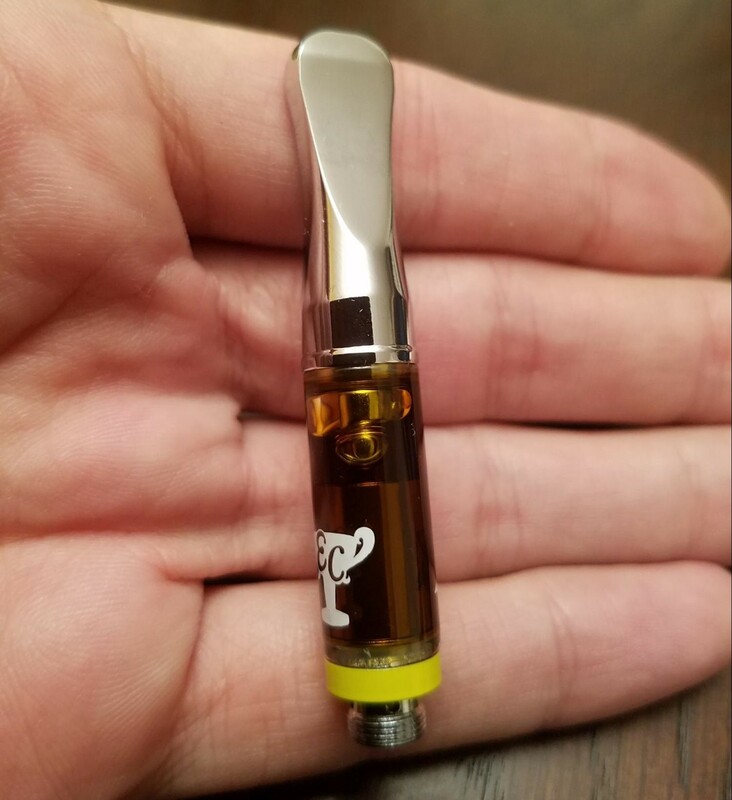 The cartridge has a thin metal mouthpiece, which I prefer over plastic, and a glass tank stamped with the ABX and Emerald Cup logos on either side. There’s even a yellow band looped around the base of the cart so you won’t forget the strain. Once our D.D. parked and posted I screwed the cartridge onto my battery and took a big puff. It pulled well enough and was more or less smooth on the inhale. However, on the exhale I had a bit of a coughing fit and my nose start tingling as the vapor was a little harsh for my liking. The flavor was a bit bland, not what I expected from a Pineapple Afghani cartridge. ABX advertises only using natural terpenes, not artificially-derived ones, so I anticipated a prominent sweet and citrusy taste. Still, I appreciate not using artificial chemicals to try and make it taste more “tropical.” (Could it be that this batch was a little less flavorful than usual?) The vapor didn’t taste bad. In fact, it had the familiar taste of standard hash oil; it just fell short of my expectations. I appreciate a plain, uncomplicated CO2 extraction because I know it means that the finished product will be pure; no additives or contaminants, just quality cannabis oil. Surprisingly, the oil was thick, dark and translucent. 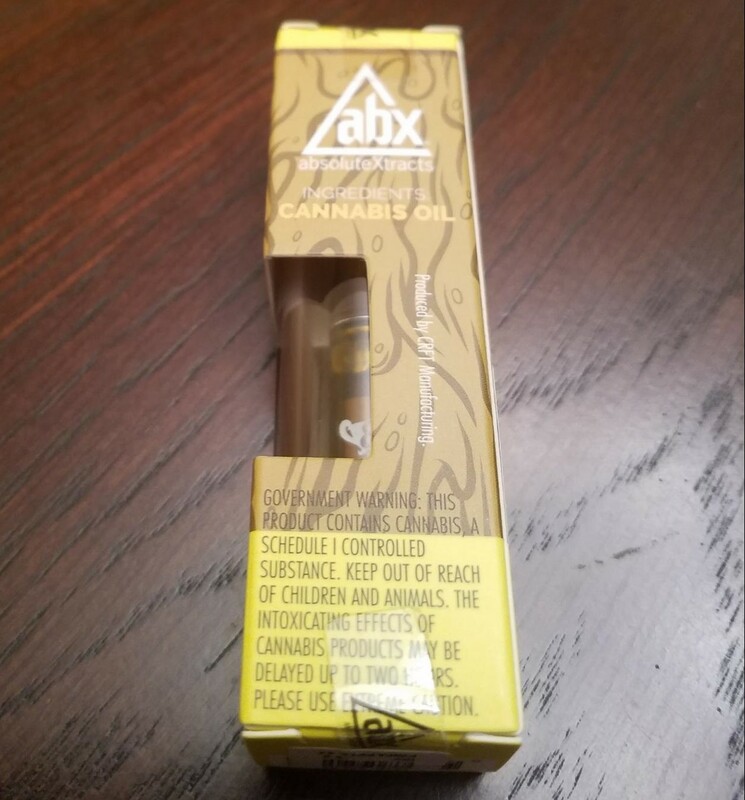 While it was certainly higher-quality than other THC carts, it fell short of what I’d like to see in a premium vaporizer cartridge. But looks aren’t everything (for most). As for use, the vape cartridge occasionally clogged, which I attributed to this viscous oil. I was able to fix this by holding down the power button on my pen to heat the oil while sucking simultaneously. This may be difficult if you’re using a vape battery that doesn’t have a button (one of the “pull to activate” models). If so, put the cartridge in warm water for a few minutes. This Absolute Xtracts hybrid vape definitely did the job as advertised. A few puffs delivered a gentle yet very noticeable high that was equal parts body and mind. By the time we entered the venue and joined the crowd I felt uplifted, motivated and calm, which was great for the concert. I didn’t think about the packed house or being stampeded by possessed fans; I just enjoyed the music’ and the communal experience. Because this isn’t a distillate like many other vapes, it feels like I’m benefitting from a full spectrum of cannabinoids. If you’re trying to wind down, veg out and fall asleep I wouldn’t recommend this Pineapple Afghani strain as its sativa-like qualities might make you more animated. This was a bit surprising considering it’s indica-dominant. Thus, it’s a great daytime vape for just about any activity: a leisurely day at the park, shopping or walking around town. Given the half gram size, potency and relative rarity of the strain, this cartridge is appropriately priced at $35. It wasn’t a deep discount bargain but I’d definitely recommend this vape oil and give it another shot. Fun and colorful drawing on the outer cardboard packaging. Thick, twist-top plastic tube protects the cartridge without taking up unnecessary space. Two foam rings around the mouthpiece and base add another layer of protection. Lacks a full list of cannabinoids and a list of at least the major terpenes. “Cannabis oil” is the only ingredient listed. Standard 510-threaded, glass tank, and metal mouthpiece. AbsoluteXtracts and Emerald Cup logos are on both sides. Yellow label ensures you remember the strain and won’t mix up your carts. The extracted oil doesn’t seem to maintain a strong terp profile that accurately reflects the strain. Not as sweet and citrusy as expected. Generic hash-oil taste; tolerable but not preferable. A few pulls made my nose tingle. Inspired a bit of coughing, but it seems to be an after-effect. Smooth on the inhale, a little harsher on the exhale. Thick, dark, translucent oil. While I’m accustomed to clearer ones, this doesn’t mean it’s a negative. Seems to be a straight CO2 oil extraction without distillation. In order to get a rating of 5, the oil must be crystal clear. Because of their extraction method, I’m not able to see all the way through the oil, thus the 3. Immediately felt a gentle calm come over me after a few big puffs. Equal feelings of euphoria in the body and head. Because this isn’t a THC distillate like many other vapes on the market, it feels as if I’m getting the benefit of a full spectrum of cannabinoids. May clog on occasion, though easily remedied. Product did not come with a battery, meaning it wasn’t truly “ready to use” straight out of the package, hence the 3. ABX has always had the same look, taste, pleasure and relief. Cartridges always work in the same manner. Appropriately priced at $35 considering the .5g size, strain, potency and detail. 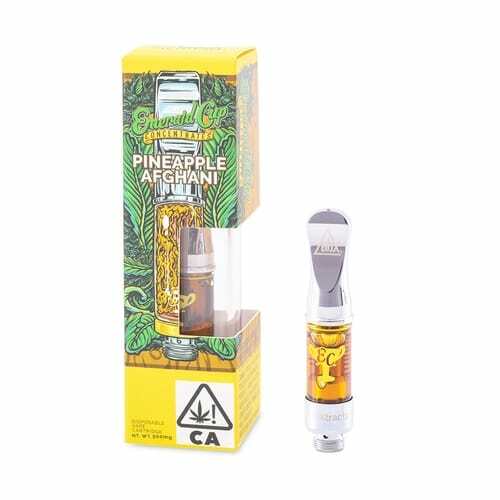 I was looking for a calm, manageable, well-balanced high and that’s exactly what I got from AbsoluteXtracts’ Pineapple Afghani vape cartridge. While it didn’t taste like its namesake fruit, by the time we walked in the concert I felt calm enough to be in a crowded environment while feeling a slightly upbeat head high. My thoughts were never racing or anxious; instead, I felt excited to be there with my friends. And despite not being the most amazing vape experience, it’s worth trying, along with other ABX products, for under $40.